Hemp seedlings grow in the test patch. Tiny doves line the top of a chain-link fence, waiting for David West to move on so they can forage for seed. 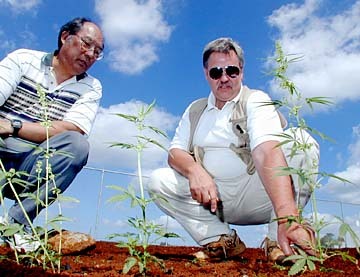 West is kneeling on a quarter-acre plot of Wahiawa red dirt and inspecting some new shoots of hemp, which bear a startling resemblance to new shoots of marijuana. "If they could, they'd be licking their beaks," he says. The doves aren't the only ones watching and waiting to see what West does. So are the Drug Enforcement Administration, state Rep. Cynthia Thielen, proponents of alternative agriculture and at least one shampoo manufacturer, among others. West has been charged with overseeing an experimental industrial hemp farm approved by the 1999 Legislature and endorsed by Gov. 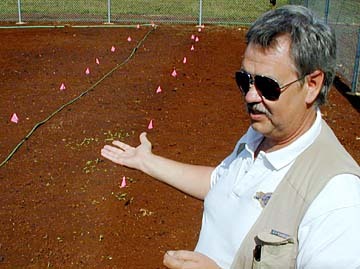 Ben Cayetano, who planted the first seeds in December. It is the only such farm in the country in 60 years, allowed under a strict two-year permit issued by the DEA last year. West is a Wisconsin plant geneticist, corn breeder and self-described "resident expert" on hemp in the United States. He was tapped for the job by Thielen, who spent years fighting misconceptions and lobbying for a plant she believes could replace sugar as Hawaii's money crop. "It never was, never has been marijuana," West expounds, explaining that hemp and pakalolo are only remotely connected because they are both in the cannabis family. "If the plant were to dry out in the sun, it would not be smokable." The early results have been mixed. An initial planting during a mid-December ground-breaking is showing some promise: Fifteen plants survived and already are 17 inches high. They will be ready for seed harvesting within a month. West is less satisfied with a Jan. 22 planting. He placed in the soil 10 varieties of European and Canadian hemp, each taking up a four-foot square section. But what he hoped would be a thick green carpet of shoots by now is only a sparse, inch-high covering. He blames the birds, or perhaps poor germination. Like farmers everywhere, though, he has to be hopeful. For one thing, West has on his side Hawaii's geographic position, which allows hemp to have five or six growing cycles a year as opposed to one in other climates. 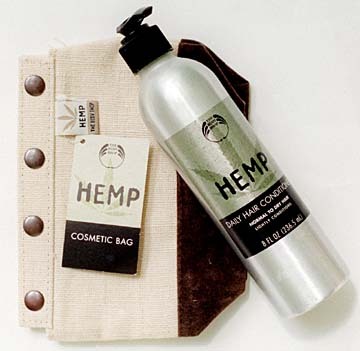 Some hemp products -- hair conditioner and a bag -- sold in stores. "That's the significant part: It goes to seed in a short period of time -- two months," West says. He plans to acquire other varieties during trips, mainly to Asian countries, and add to the single strip of shoots he has now. West receives an undisclosed salary out of a $200,000 grant to fund the farm from Alterna Professional Hair Care Products, which markets a hemp-based shampoo. He does virtually all the work himself, including the physical labor. "The project is my baby, and I'm responsible for getting the work done," he says. His "joy" at being able finally to grow hemp is matched by his zeal for the plant. Its seeds can be used for fish and bird food, oil, paint, and personal care products, he says. The stalk can be a source of fiber for clothing and building materials. Other advantages are listed in articles on the Web site for GamETec, a one-person company he started in 1993, http://www.gametec.com. "The seed itself you could live on," he says, imagining a crisis in which Hawaii might have to grow a quick crop to provide for a variety of needs. But West is mindful of the forces against him. He asks a photographer not to show the background to the farm, whose chain-link fence is electronically secured. And he harshly criticizes the federal government for scheduling hemp as a drug and, at least until now, prohibiting its growth. Ironically, he says, hemp could help the antidrug battle because cross-pollination would weaken marijuana strains without having a reverse effect. "Hemp is a great crop, but why does the farmer have to justify growing it?" West asks rhetorically. "We should be asking those who are trying to prevent him from growing it to justify it." Barring birds and bureaucrats, a full-grown industry still may be years away. But standing under the Wahiawa sun in his small field of dreams, West seems hopeful nonetheless. "We've only just begun," he says. WITHIN four months, the Drug Enforcement Administration will have regulations ready for comment that would allow farmers to grow hemp, according to state Rep. Cynthia Thielen. "It's tremendously encouraging that the regulations are now in the review process ... It's a big step forward," she said. Thielen (R, Kailua) last month was given Small Business Hawaii's award as 1999's outstanding legislator for "calling for new economic diversification options for the state" and tenaciously winning passage of "bold" legislation. She earlier had been named "1999 Hempster of the Year" by the International Hemp Journal, a Sonoma, Calif.-based industry quarterly. Hemp proponents point to its versatility, saying it could be used for everything from cosmetics to homes. Alterna Professional Hair Care Products, which is funding the experimental farm in Wahiawa, said it would prefer to buy nutrient-rich hemp oil in America rather than importing it from France. "We are the hemp shampoo," said Kim Mitchell, Alterna's corporate communications director, who met Thielen at a natural-products trade show in Las Angeles last year and took her funding idea to executives. Alterna products have been appearing in Hawaii professional salons in the last month or two, she said. Thielen became interested in hemp's potential through her son Peter, who wholesales hemp resortwear and saw the unemployment that came when sugar plantations on Kauai closed. While she doesn't believe Hawaii is large enough to support a fabric mill, she thinks other hemp-base products could be marketed after several years. An HC&D plant on Maui that processes sugar cane into building materials could be used to process hemp, "which is better because it would be more wind resistant and fire retardant," she said. She plans to fly to England in May at her own expense to consult with experts on how to use machinery to construct houses out of hemp-based building materials. Thielen hopes the DEA will adopt the hemp-growing regulations before the Wahiawa farm's two-year permit expires. She said she pushed for Hawaii to be the first in the nation to grow hemp because she wanted to draw attention to the state "as the location of an agricultural crop of tremendous potential." "I wanted Hawaii to be the leader of pro-economic development opportunities," she said. "That was very important to me."